Stephen Angus has been in the entertainment industry for more than 45 years. His father was a drummer with the 12th Army Band, and performed on the Ed Sullivan show. Stephen met Larry Teal and studied classical saxophone with his students through high school. He attended Western Michigan University on full scholarship for a year as a Music Performance major; then attended Michigan State University, studying with James Forger and Joe Luloff, for four more. 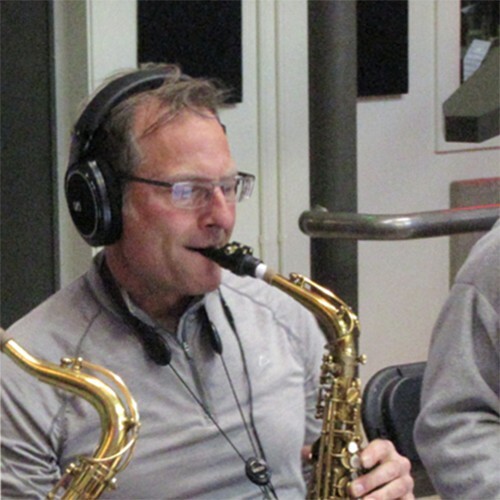 After discovering Rock ’n Roll as sax man for the East Lansing band, Let’s Talk About Girls, Stephen dropped the sax completely and went to grad school for acting in Chicago. Thirty years and three major cities later, he picked up a bari sax for the 2006 indie film, “The Choice” in which he starred as an ex-pat jazz musician with Blue Note artist Patricia Barber. Currently, he’s the multi-sax sideman for Tim Hill (Americana); tenor sax with Gora Gora Orkestar (a Balkan/Second Line brass band); and Lead Alto for the FJO.